We give performances of our own intriguing and audience-friendly story-telling sequences. These are carefully crafted, using narrated texts and unaccompanied sung music of all kinds. Our latest recording THE GREAT AND WIDE SEA includes a complete reading of Coleridge's epic poem The Rime of the Ancient Mariner with original music by Lynne Plowman. JOHN BOWEN was a chorister of St Paul’s Cathedral, choral scholar Kings’ College Cambridge, studied Royal College of Music. Career in England and Europe - as soloist including Staatsoper Berlin and at La Monnaie Opera, Brussels & as ensemble singer including René Jacobs’s Baroque opera projects in Florence, Brussels, New York, London etc. Recordings for Harmonia Mundi and Hyperion. STEPHEN BURROWS is Director of Music The Oratory School, Reading. Studied Bristol University (University Organ Scholar). Sang in choirs of St George’s Chapel, Windsor; Westminster Cathedral. Works as ensemble singer (Tenebrae, The Orlando Consort, New London Consort, Royal Opera House) and as soloist. Has contributed a number of special arrangements for Opus Anglicanum. 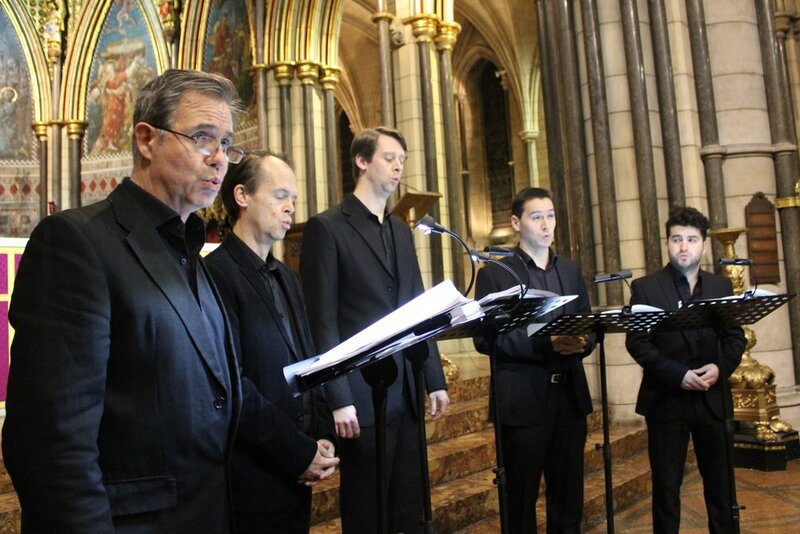 DAVID DE WINTER was a chorister of Westminster Cathedral, and studied at Durham University and the Royal Academy of Music (Stanley Picker Trust and Leverhulme awards). He sings in Westminster Cathedral choir. Opera - Billy Budd (Glyndebourne and New York) Hugh the Drover - title role Hampstead Garden Opera. Soloist and recitalist (London English Song Festival & St James’ s Piccadilly). ROLAND ROBERTSON was a chorister at Canterbury and Winchester Cathedrals, Organ Scholar at Wells, and a Choral Scholar at King's College, Cambridge. After vocal studies at the RNCM and a professional singing career in London, he developed a busy career in teaching and is now Director of Music at Prior Park College in Bath. He directs the music for Opus Anglicanum. JAMES BIRCHALL was a chorister at St George’s Chapel, Windsor Castle and later studied at St John’s College, Cambridge, the Royal Academy of Music and the Royal Scottish Academy of Music and Drama. His career combines engagements as an oratorio soloist with ensemble singing with the UK’s top professional chamber choirs and appearances with the Royal Opera Chorus.